Neighbours are fighting plans for low-cost flats in Portslade because the scheme includes too few parking spaces. They are objecting to 111 flats on the site of the former Belgrave Day Centre, in Clarendon Place, off North Street, Portslade. 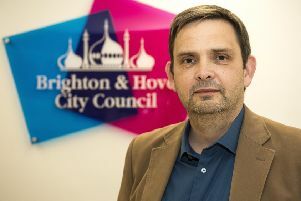 The scheme has been drawn up by Homes for Brighton and Hove, the “living wage joint venture” set up by Hyde Housing and Brighton and Hove City Council. The flats would be in two blocks – one of them six storeys high and the other eight storeys. Most would have one or two bedrooms, with a few studios and some three-bed flats as well. The aim is for a mix of shared ownership and rented homes, with rents linked to the local £9-an-hour living wage. So far 33 objections have been lodged on the council website with concerns including a lack of parking and the height of the buildings. One anonymous objector said: “The development must provide adequate parking spaces for the 111 new residents. “The proposed 10 spaces is not acceptable. The area is already completely saturated and current residents have nowhere to park. A transport statement submitted as part of the planning application said that there were 12 spaces, including two disabled bays. It also listed four active electric vehicle charging points, 115 long-stay cycle parking spaces and 39 short-stay (visitor) cycle spaces. cost of buying of a bicycle. Each of the first people to move in would also be offered a 12-month Brighton and Hove Buses season ticket. Another objector, whose name was redacted, said: “We can not park in our own streets sometimes, let alone near our houses. “This is going to cause civil disobedience if you are not careful. People are already really stressed as cars are being parked for days and weeks in this area because of the permits recently introduced in Hove. People are also worried about the impact of hundreds of people moving into the area on GP services and schools. Another commenter, whose name was redacted, said: “Given that local GP surgeries are already struggling to deal with the amount of patients, it is not acceptable that the current plan has no provision for this. Another said: “There are not enough local school places for the children of existing residents already. To see the application, search for BH2018/03629 on the council’s website at planningapps.brighton-hove.gov.uk.